southern regions of KwaZulu Natal, between the Southern Drakensberg, the Midlands Mistbelt and the Eastern Cape. the Mission churches are hidden treasures that we want to share with the world. The trail will eventually extend for ± 250 km through stunning countryside, farms, grasslands and forests, home of the rare Blue Swallow, Cape parrot, Purple-crested Lourie (gwalagwala) and the Black-winged Plover (titihoya). The pilgrimage will start at Mariannhill Monastery and the burial place of Abbot Francis Pfanner. The bus will take us to Reichenau Mission for a special blessing. This was the first satellite mission built by the Trappists in 1886, about 18 km from Underberg in the Southern Drakensberg. From Reichenau the trail meanders through rural villages and country towns, visiting 8 of the historical Trappist missions, each with a beautiful church designed by Brother Nivard Streicher, a humble German monk, over a century ago. The missions include Kevelaer, Centocow, Lourdes, Emaus, Maria Hilf, Mariathal and Einsiedeln, before arriving at the ‘Mother Mission’ at Mariannhill near Pinetown 8 days later. As you follow in the footsteps of the Trappist monks and Sisters of the Precious Blood, who served at the missions, you will learn about the history of the Trappists and their missions; fascinating folk-lore and legends, the landscape, and the fauna and flora of this wonderful trail. We promise you stunning walking, through gorgeous landscapes in what Alan Paton described in Cry the Beloved Country as “the fairest valley in Africa.” Some of the landscape is ancient and sacred and you might see the shy gwalagwala bird with its brilliant colours, which in Swaziland, only members of the Royal are allowed to wear. Your trail guide is familiar with the plants, folklore and much of the history of the trail and knows a lot about the 8 historic Mission churches you will visit. Note: This is a challenging trail, not so much because of the daily distances, but because it passes through remote, rural areas with no access to taxis or other transport, and very few villages. Some of the small, rural villages have a tuck shop - called a Spaza - which sell cold drinks and sweets but are little more than a lean-to shack. Although there is a back-up bus it is not possible to support the group on more than 20% of the trails and walkers need to be able to carry their water and snacks each day. In the slower ‘Walk and Ride’ group we walk half the distances of the regular trails ± 8km – 10km per day. Both groups meet at Mariannhill Monastery and the cost of the package includes transport to the start at Reichenau Mission and return to Mariannhill at the end of the walk. There is accommodation available at Mariannhill in the Retreat or at Tre Fontane for those coming from out of town. The bus transfers pilgrims to and from the trail and our luggage to each overnight stop. Both groups visit 8 missions – Reichenau, Kevelaer, Centocow, Lourdes, Emaus, Maria Hilf (aka Mary Help), Mariathal, as well as St Isidor at Kings Grant, and Mariannhill. We stay at two missions – Centocow and Emaus - and also at Kings Grant. Talks, lectures and videos are shown at most places in the evenings and mass is available in some churches. The October walk coincides with the Creighton Steam Train festival so we will ride from Creighton to Riverside on the steam train. Raymond will meet us there with the bus and will drop us a couple of km from Centocow so that we can walk to the Mission. Pilgrims are given a Pilgrim Record to have stamped at each Mission and a special blessing is held at the end of the walk with certificates awarded. 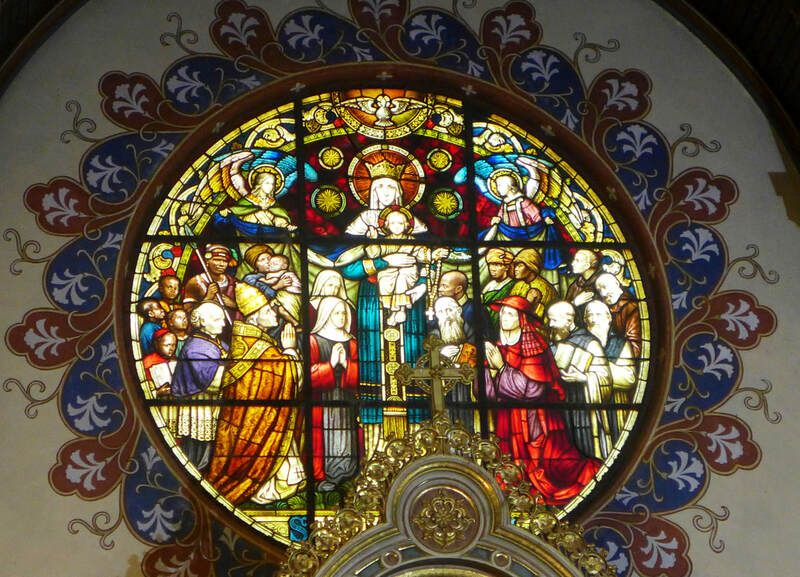 The magnificent stained glass at Centocow Mission tells the complete story of Abbot Francis Pfanner founder of Mariannhill, Chief Sakayedwa of Polela who asked him to build a Mission near Underberg, the Sisters of the Precious Blood that he founded in 1885, and his successors. Groups are restricted to 12 people. Transfers from the start at Mariannhill and back are included. Groups will be accompanied by a Group Leader and a local trail guide (for security). Participants will be given an Abbot Pfanner Trappist Trail ‘ pilgrim record’ to have stamped at the missions, a booklet containing descriptions of daily stages, and information leaflets on each of the 9 missions. You will be able to purchase a Trappist cross to hang on your day-pack, Abbot Pfanner pins, novenas and booklets which are available at Mariannhill and most Missions. Accommodation will be in a Mission (or two) as well as small B and B establishments, lodges and country guest farms. Only a couple of single rooms will be available. Some of the missions are two days walking apart and the group will be collected from a pre-arranged place and transferred back there the next day. When you return to Mariannhill you will be given the Abbot Pfanner Trappist Trail pilgrimage certificate. With the group: Meet at Mariannhill. Cars can be parked there safely for the duration of the walk. Reichenau is 18 km from Underberg and 25 km from Bulwer. ​This walk includes the Creighton Aloe Festival and a 3 hour train ride from Creighton to Riverside. email aptta@mweb.co.za for more information. 2019 prices to be determined allowing for increases in fuel and accommodation costs.